Most of you know that I published a book last spring. The book is called Changing My Mind: Reinventing Myself In Retirement. If you didn’t already know that, I must not have been doing my job publicizing it. It feels like I’m mentioning it every time I open my mouth. Few people are good at tooting their own horn and I am no exception. I’ve been extremely uncomfortable trying to hawk my book, but I’ve given it my best shot. That isn’t to say that I’ve given it the best shot anyone could possibly give it. Considering who I am and where my strengths lie, I gave it my best shot for me. It is one of those “push pass your comfort zone” kind of things. I’ll never be able to say that I am an expert marketer or brand developer. In fact, I am not a brand. I am just Terri. All right, I am just Terri and Dorry, if you want to be technical. Let’s just say that I don’t have the expertise, inclination, confidence, or sufficiently thick skin to promote my book in a way that will make it fly off the shelves. I’m not good at selling anything, least of all myself. Still, I’ve tried very hard to get past my insecurities and weaknesses in this area, so as not to cheat myself out of the complete experience and opportunity on this book publishing journey. I’ve brainstormed ideas on how to promote the book. I’ve been proud of myself for following through on many of them. Some of the marketing seeds I have sown may still bear fruit down the line. A local newspaper recently published a feature story about me and my book, some six months after I originally contacted her. I’ve overcome my shyness to talk to people who might be able to publicize my book. I bring it up in the blog and in conversations with people waaaaay more than I feel comfortable doing. All this may have been good for my moral fiber and character development, but I don’t think it has really resulted in actual sales. To be honest, I’ve been a little surprised that the sales have not been at least a little higher than they have been. Since I launched the book last May, I’ve sold about 100 copies. I’d say at least half of those have been to close personal friends and family members. Heck, Max bought two copies. I’m not demoralized or sad or disappointed or anything. For me, the act of producing the book truly was the pay-off. I’d love to have made money or at least broken even, but I was not counting on it. I look at the money I spend on this blog and on the publication of the book the way some people might look at the money they spend playing golf. I am spending the money for my own enjoyment. I just thought, with the blog readership, I might have sold a few hundred copies. I’m not trying to make anyone feel guilty. This is a curiosity, not a complaint. I mention money because I am coming up on my renewal date for the author services I contracted. I’ve had to make a decision about to what extent I want to continue them. I pay a flat fee for the distribution of both the electronic and paperback editions of the book. I also pay a fee for servicing returns, since no bookstore will stock a book unless it is returnable. As you probably know (unless I have completely failed in the publicity department), I also maintain a direct-to-reader sales page (https://secure.mybookorders.com/orderpage/2076) where people can purchase the book. The direct-to-reader sales page has the advantage of allowing me to offer buyers a discount on the sales price of the book. The other advantage is that I get a MUCH bigger royalty from books purchased on the direct-to-reader sales page than I do on books purchased through third parties like Amazon. Maintaining that direct-to-reader sales page is fairly expensive, so it doesn’t seem worth the cost. The vast majority of the dozens of books I’ve sold have been purchased either directly from me personally or from online retailers such as Amazon. Therefore, I’ve decided not to renew https://secure.mybookorders.com/orderpage/2076 when it expires on March 26, 2019. If you would like to order a copy of Changing My Mind: Reinventing Myself In Retirement on that website and get a 15% discount, please do so before the middle of February. Use the promo code terri to claim your discount. I will still be offering the book on amazon.com, barnesandnoble.com, and other online retailers for at least the next year. I am also paying for the returns service for another year because the local Barnes and Noble has agreed to feature me in their next “local author” signing event and the book needs to be returnable for them to order copies. No one can tell me when that event will be, so I’m not sure when/if this will come to pass, but I thought it was worth a shot. If any of you live near The Villages in Florida and would like to attend a signing, please contact Ashley at the Lake Sumpter Landing Barnes and Noble. Maybe that would speed things along. At any rate, thank you all for your continued support. I just wanted to let you know that the sales website will be going away in a few weeks so you could jump on the opportunity to order discounted books before it was gone. See? Told ya I was bad at self-promotion! Anyone who has read the book care to comment? Please share your perspective by leaving a comment. In the alternative, you can email me at terriretirement@gmail.com. Have a proudly horn-tooting day! Author TerriPosted on January 16, 2019 January 16, 2019 Tags nature, retirement lifestyle blog, snakes6 Comments on Snakes. Why Did It Have To Be Snakes? Every now and again, someone contacts me to ask if I am interested in featuring guest bloggers on www.terrilabonte.com. I always agonize over these requests. Sometimes, I am guilty of procrastinating because I don’t know how to respond. The thing is, I recognize that there might be value in having guest bloggers at www.terrilabonte.com. I even recognize that at least some of these volunteers may be able to offer more valuable content than I provide. The problem is that the blog is so personal that I have not been able to release that kind of control over it. If I included guest bloggers, I would not have to worry so much about making sure I had a new article every week. Not that I worry too much about that. Being who I am, I almost always have a month or more of posts ready to go at any given time. Most of the people who have contacted me have specific fields of expertise. Unlike me, they are experts at something. Maybe you all would appreciate hearing from someone who actually knows what he or she is talking about instead of simply relying on the inner workings of my mind for entertainment. If I had guest bloggers, I could probably increase my readership with cross promotion. If they have a core group of readers of their own who follow them to my blog, perhaps those folks will stick around and read my content. There is one more serious aspect to consider in deciding whether to accept guest bloggers. I might be boring myself out of existence. When I first started writing the blog, a dear friend of mine asked what I would do if I did not attract the number of readers that my research suggested would indicate “success.” I told him that Terri LaBonte would keep writing as long as she had something to say. I can’t believe she has been talking for three years. You would think that I surely would have run out of things to say by now. Perhaps I have and just don’t realize it. I need your help to recognize the truth and face it square in the eye. I am asking for genuine feedback. Please tell me if you think I am getting stale or repetitive. Please be honest, but not brutal. Is it time for the blog to go to bloggy heaven? Or is it just time for the occasional new voice to infuse the content with fresh ideas? Should www.terrilabonte.com become a chorus instead of a solo act? Or are you content knowing that I am still the one spinning yarns and telling tales? Okay, time for your thoughts. Please share your perspective on whether the blog should continue as it is, continue with occasional guest bloggers, or simply fade away. You can provide your feedback by leaving a comment. In the alternative, you can email me at terriretirement@gmail.com. 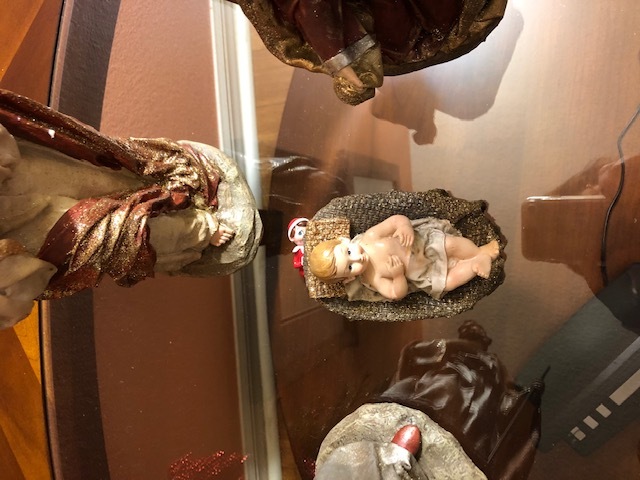 Author TerriPosted on January 9, 2019 January 9, 2019 Tags feedback, retirement lifestyle blog10 Comments on Fresh Blood? Max and I played Elf On The Shelf this holiday season. Every morning, he hid my elf, Kringle, somewhere in our great room. We usually wake up at about the same time, but I take much longer to actually get out of bed so he had plenty of time to find ingenious hiding places for Kringle. To increase the degree of difficulty, I don’t even have a standard, full-size shelf elf. Most of the elves sold in retail outlets are about a foot tall, with long squishy legs. I have the Elf on the Shelf miniature figurine. Kringle is made entirely of plastic and is about as big as my thumb. Every morning, I went on the hunt to figure out where that mischievous elf was lurking. Given his size and the excessive number of nooks and crannies in our great room, this was not an easy task. Kringle was an uncommonly good hider. Max proved that he has exceptional elf-whispering skills. Some days, I found Kringle pretty easily. Most days, I needed a hint. On a few days, I needed multiple, fairly pointed hints. We had a good time and I usually finished each day’s search by giggling and marveling over Kringle’s silliness. Pot calling the kettle black, anyone? Yes, it was a silly game, but I learned several valuable life lessons from the Elf on the Shelf. In this season of giving, let me share my higher elfucation. Use all your senses to perceive. When we search for things, we say we are “looking for” them. Still, searching is about using all the senses, not just sight. 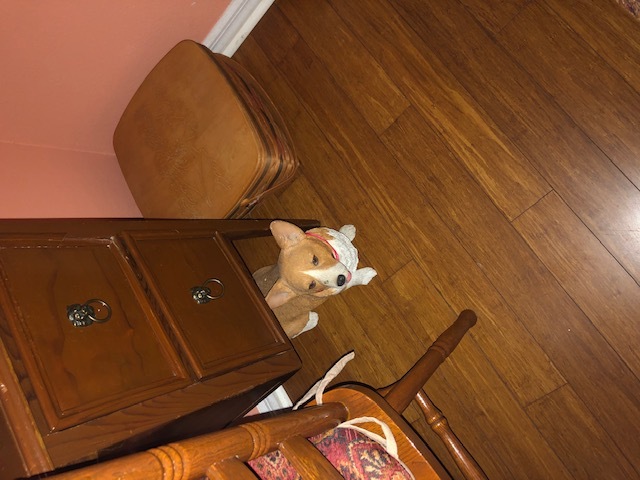 There were some mornings when Kringle was hiding someplace where I just could not see him. I had to “see” him with my ears by listening to the clues and with my hands by feeling around on a shelf high above my head. Sometimes, I even had to use my sixth sense. One morning, Max completed his elf duty and then went to get his car serviced. When I got up and began roaming around the living room, it suddenly occurred to me that maybe Kringle didn’t want to get out of bed, either. I looked in his little velvet pouch and there he was, snug as a bug in a rug. We all need smart friends. My friends may be the best thing about me. As I have navigated the perilous waters of changing my life, my friends have kept me afloat. Keeping me afloat has involved a great deal of emotional support, but I’ve also needed all kinds of practical advice and assistance. Also, without regular reality checks, I would have descended down my own private rabbit hole long before now, never to be heard from again. Who has provided the practical advice and reality checks? My very smart friends, of course. Yes, Google is a wonderful resource, but it just can’t provide the warm fuzzies that my friends lavish extravagantly on me. Kringle reminded me of the benefits of smart friends. He’s pretty smart, too. He knows the difference between a smart aleck and a wise man. The answer can be right in front of our face, but our point of view may be preventing us from seeing it. 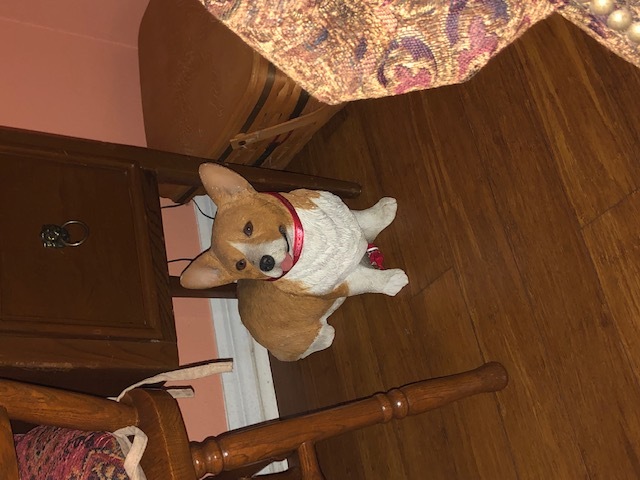 One morning, Kringle was hiding effectively between the front legs of the welsh corgi figurine that sits under the vanity my father made me. I looked all over the vanity and all around it, but still could not see it. Even after Max gave me some clues that all but pointed me to the elf, I could not see him. Finally, I realized that perspective was making all the difference. If I stood directly in front of the corgi. Kringle was obscured by the barrel chest of the figurine. However, when I stood about four feet away, Kringle was in plain sight! I wonder how many other problems in my life I could solve if I just let myself wander a bit away from them until the answer is clear. The best place to be is close to Jesus. I don’t really need to say anything more. 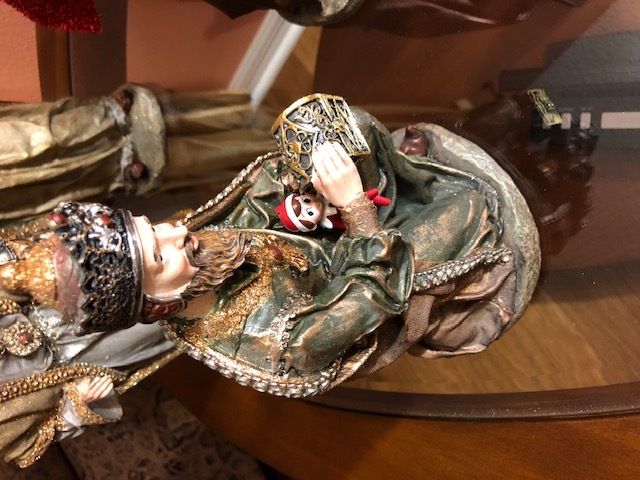 Even a plastic elf knows the best place to be is close to Jesus. I just couldn’t help adding one more holiday post! I hope you don’t mind. I put away all the Christmas decorations and was a bit sad that all the ho-ho- holidays were done. What do you miss most about Christmas? Please share your perspective by leaving a comment. In the alternative, you can email me at terriretirement@gmail.com. In retrospect, I think I would have to declare 2018 to be the Year of Terri. I know it is more than a bit self-absorbed, but I’m afraid that is sort of the nature of this blog. After all, isn’t it found at www.terrilabonte.com? The website address should give it away. Surely, you must be used to reading my endless angsting over the trials and tribulations of my life by now? What makes this blog post different is that I am actually celebrating something about my life this time. In 2018, I gave myself permission to make things all about me. I have to say I am quite pleased with the results. Everyone always tells you that you need to take care of yourself, especially when you are going through a rough time or are immersed in caring for someone else. They tell you that it will help you be a better caretaker. They tell you it will refresh you for whatever difficulties you must bear. They tell you that you deserve it. While I understand the benefits of taking care of oneself, I always seem to have practical reasons for not actually doing it. Time is a finite quality and life sometimes seems to have a way of using up that finite quality on more pressing matters than me. There is also a stronger, more sinister, and uglier reason for not taking care of myself. It isn’t that I’m a saint. I’m not that selfless person who is so committed to the welfare of others that she doesn’t even want to take the time and energy to do something for herself. It is quite the reverse. I really, really like to do things to make myself happy. In fact, the dirty little secret about why I avoid taking care of myself is that I am afraid it would be all too easy for me to slide down that slippery slope of selfishness and become one of those horrible, self-involved, spoiled people who lives for their own perceived entitlements. I cringe at the thought of that happening to me. I honestly don’t think I could live with myself if I allowed me to be as selfish as I think I am probably inclined to be. When my mother was ill, I was doubly afraid that doing anything for myself would drive me right over the precipice of selfishness. It was often so hard to be with her and watch her decline, I knew it was taking all my discipline and archived love to journey with her. I was afraid that, if I stopped for a second, I would never have the strength to be able to start again. After a year of listening to everyone telling me that I needed to take time off and take care of myself, I finally decided to try living a little differently after my mother’s death. I decided to give myself some time to indulge my selfishness… to do things I wanted to do, buy things I wanted to buy, behave as I wanted to behave. To guard against my fear of transforming into an intolerable, worthless human being, I gave myself a deadline of a year. At the end of the year, I vowed, I would make a concerted effort to rejoin the world community and become a better, holier person. Then the miracle happened. I didn’t need to make a concerted effort. In 2018, I converted to the Episcopal Church. I went to California on my own to scatter my mom’s ashes and see loved ones. I continued writing my blog. I published my book. I hosted three parties, including cooking Thanksgiving dinner. I joined Facebook. I participated in several fun activities around my community. I bought two sets of Lennox flatware just because I wanted them. I took a trip to Texas to see a dear friend of mine from Hawaii who was working there. I’ve ordered a number of purchases from QVC that weren’t hugely expensive but were more than I would usually spend for such items. I went to Discovery Cove, my “once in a lifetime” experience, for the second time. I spent ten beautiful autumn days in New England. I got tinkified at Disney World. I bought a $100 fake fur coverlet because I’d always wanted a good quality faux snow leopard blanket. These are just the indulgences that I can recall right off the bat. You can see I had a rather madcap year of pleasing myself. It is exactly the kind of thing I feared would turn me into a ranting, self-serving, horrible megalomaniac. It didn’t. It turns out that “they” are right when they say taking care of yourself helps you do a better job of taking care of others. Nearly all of these activities that I thought were so selfish actually opened the door to me being a much better, more connected, more empathetic, and more effectual person. They also, strangely enough, strengthened my Christian walk. In converting to the Episcopal Church, I really thought I was doing it because I wanted to feel more alive in my faith. I wanted a livelier faith experience and a stronger feeling of God’s presence in my life. When I read that now, I can see that my motivations were initially pretty me-oriented. I wasn’t thinking about how I could serve God and His family better. I was thinking about how I wanted to feel. Despite this initial motivation, my walk towards conversion led me to a much deeper, more intimate, and more service-minded connection with God and His people. By allowing myself to go down this path in the way I did, I allowed God to bless me with an extra helping of grace. Also, it opened my heart to becoming involved in ministries. Without having to “discipline” myself to volunteer after my year of self-indulgence, I organically began to participate. I deliver meals to the homebound. I presented a discussion program at a women’s group meeting. I am slated to help launch a faith enrichment program at my church in 2019. Joining more activities in my community has also led me to projects to help others. One of my new activities raises money for books to support a local early learning and literacy center. My walk into the Episcopal Church and joining more activities in my community also helped me be a more secure, comfortable person. That may sound, again, like a benefit to me. It was, but it also helped open that closed door inside me that keeps me from doing things that I am naturally inclined to do. I think I am a fairly empathetic, thoughtful person. However, in the past, I often didn’t act on those feelings for fear of being intrusive or being rejected. In my new, self-centered persona, I am more able to reach out to others and let them feel my heart. Writing and publishing my book has also helped me grow in that way. Facebook helped me connect with old and new friends. I have also been able to use Facebook to reinvigorate my Thankful Thursday project from my working days. By sowing thankfulness each Thursday on the Facebook field, I think I am brightening life a little tiny bit. I am also able to spread the love of God in that endeavor. The whole project seems to be getting a little traction, so maybe the internet winds are blowing the thankful seeds further than I realize. In pursuing my fun, friends, and travel activities, I find I am regaining some of the spirit that was always me before sadness quelled it. I feel better and, as a result, I am a better companion for everyone who loves me. I love better and, therefore, I am easier to love. Yes, 2018 was the Year of Terri. I am hoping 2019 is, as well! What will you do to make 2019 the year of you? Please share your perspective by leaving a comment. In the alternative, you can email me at terriretirement@gmail.com. Happy New Year! Thank you for reading! Many of you probably remember my dilemma over whether or not I should give myself permission to run headlong into my second childhood and get bippity-boppetied. Everyone who knows me was kind of dumbfounded that I would even hesitate over this opportunity. It was a bit surprising, even to me. The night before my date with the pixie duster, I got a text from a friend asking if I was excited. I responded that I was, but, to be honest, I wasn’t sure exactly how I felt. I was happy and looking forward to it, but I don’t know that I could really say I was excited or enthusiastic or anything like that. In fact, I had a kind of flat feeling about the whole thing. There was something blocking me from completely letting go and getting giddy. It took me awhile to realize what it was. My mom should have been there with me. My parents called me Tinker Bell from the time I was born. My mother called me by that pet name my whole life. It was a special thing between us. We enjoyed a lot of great experiences together. Many of the adventures we had after moving to Florida involved trips to Disney. I pushed her around Epcot on a regular basis. She especially enjoyed the flower and garden festival. One of my all-time favorite memories of her was when I took her to see the Osborne Christmas light show at Disney Hollywood Studios. We were so happy that night. We visited Tinker Bell together in the Magic Kingdom and I have the photo to prove it. It just seemed to me that, if I was going to go get tinkified, it didn’t make any sense that my mom wouldn’t get to share the experience. I realized that my hesitation about the experience had never been about spending the money or looking silly. It was really all about not quite knowing how to revel in this specific experience without my mother. After I had this epiphany, I consciously decided my mother would have loved that I was being tinkified and she would want me to enjoy it for both of us. I decided to throw myself into the experience, whatever it ended up being. I would feel whatever feelings came up and I would just let the day unfold however it was going to unfold. I wasn’t going to try to form any expectations or manage the process. I was just going to live it. I was going to be excited. I did make a couple of preparations. For one thing, I had two very dear friends accompanying me. I called them my “pixie posse.” They volunteered to come along and observe while I was still deliberating about whether or not to do it, long before I realized why I was so hesitant. They wanted to come with me to enjoy the day and to support me. I’m sure they were thinking it would be a fun outing for all of us. On the day of the tinkifying, I leaned into their love instead of wallowing over the loved one that was missing. I also wore my “mom” ring. 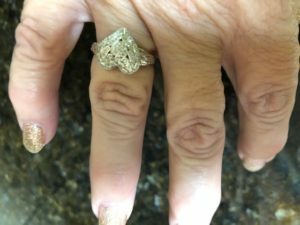 Right after my mom died, I bought a silver and diamond ring sculpted into a heart formed by two angel wings. I wear it when I am going somewhere or doing something that I think my mother would especially enjoy or when I really, really want to feel her close to me. I knew my tinkifying trip was going to be just such an experience. I was documenting this whole experience on Facebook, so I posted a picture of the ring with an explanation of its meaning. The day turned out to be wonderful. I did feel waves of momma sadness often during the day, but I’ve learned that sadness and pain don’t have to be the same thing. These waves didn’t hurt. I just surfed them when they crested and rode them to the shore. Then, I paddled myself back out into the happiness. For the most part, I spent the day feeling joyful, playful, free, giddy, and excited. I was Tinker Bell. I was rocking the Pixie Hollow world. When I saw the pictures, I felt pretty for the first time in my life. Not just pretty for me, but pretty… full stop. Momma would have loved it. It occurred to me that this is the way my mother saw me every time she looked at me. When my brother read my Facebook post about the “mom” ring, he replied that I should keep the ring on always because my mother loved doing stuff with me. He also reminded me that Momma is with me all the time, in everything I do. I believe he is right. She was with me at the pixie dusting and she is with me in Always Always Land. What have you done to make sense of living when a person you love has died? Please share your perspective by leaving a comment. In the alternative, you can email me at terriretirement@gmail.com. P.S. I’m sending an extra special portion of love to those of you who might be having a difficult time facing the holidays with loss weighing on your heart. It is hard, I know. As a friend of mine tells me, it is important to learn how to be happy and sad at the same time. I wish and pray for your happiness to find a place in your heart. I’ve been shopping. Imagine that. And it isn’t just Christmas shopping, either. In addition to the other pratfalls in my keystone cop tour of New England, I seem to have lost about 30% of the wardrobe I brought on the trip. It went missing somewhere between Maine and Massachusetts. I am sure the jeans, three blouses, two bras, and one sock are enjoying their extended vacation in one of the many lovely inns we frequented in our travels. I think it was probably all that moving from one hotel to another practically every day. Despite my best intentions and organization techniques, it doesn’t surprise me that some of my clothes did not find their way back into suitcases. As I pointed out in my blog on October 17th (http://www.terrilabonte.com/2018/10/twenty-two-and-a-half-winks/), I am not a great sleeper. Max is an even worse sleeper. We are both even more inept at it when we are on vacation. Neither one of us slept much ‘during our New England trip. Nearly every morning, we had to pry ourselves out of bed in the wee hours to get ourselves and our luggage ready to board the bus. This meant functioning (or disfunctioning) on about four-and-a-quarter winks on a pretty regular basis. In my sleep deprived and harried state, I am sure that some clothes that I intended to transfer from my overnight bag to a laundry bag in my suitcase just decided to stay in bed. I am not going to dignify the disappearance of the single sock with a comment. Heaven knows, I lose single socks regularly in my own clothes dryer at home. The fact that I lost one in New England barely ripples my radar. The other missing articles of clothing are a bit more significant. The loss was a bit disconcerting, but the up side was that I had an entirely acceptable excuse to go shopping. Replacing the bras was not a huge problem. It was pretty easy to walk into one store and simply buy the same size, style, and brand I lost. The jeans were tougher. The missing jeans were not new or particularly expensive, but they fit really, really well. I am mourning that loss a little. Sure, I could walk into any department store and buy more jeans, but finding a pair of jeans that actually fits my bizarrely shaped backside is rather like hunting the elusive unicorn. I have learned that I cannot really hunt for a pair of jeans like that. I must be patient and wait for the jeans to find me. I have been out shopping several times, maintaining the fiction that I am only trying to replace the three blouses that got lost on vacation. However, I find myself running into the same problem again and again. As I roam the department stores, my eyes keep lighting on true autumn clothes. I keep pulling sweaters, jackets, and corduroys off the racks. As I view myself, in the safety of an air-conditioned fitting room, draped in cool weather weight fabrics in fall foliage colors, I have a hard time not purchasing those garments. It must be a conspiracy. It is freakin’ Florida. There is no autumn. Why do they even display such items? Probably because I am not the only one who hauls out the cozy the instant the mercury drops below 90 degrees. I have lived in Florida almost four years. You’d think I’d learn my lesson. Florida may be in the same time zone as the Northeast, but it is certainly not in the same clothing zone. Yes, it may get cool enough to don a sweater for an hour or even a day, but the weather is just teasing. By the next day, the mere thought of wool will be enough to send my sweat glands into overdrive. I have numerous articles of clothing in my closet that I have worn only once or twice because the climate in Florida just won’t cooperate. Just because I am no longer sweating while actually in the shower does not mean it is sweater weather. By the time we have our eight days or so of winter and it is chilly enough to justify something heavier than a t-shirt, it is usually January or February. By then, autumnal-colored clothing doesn’t seem quite right either. At least, before I went on vacation, I could tell myself that I could at least wear those seductively cuddly clothes in New England. Now that some of those clothes apparently decided it was too hot to return to Florida, I truly have no excuse to buy a rust-colored corduroy skirt and three sweaters. Yet, I did. Heavy sigh. Please, somebody stop me before I buy yet another article of clothing that it will never be cool enough to wear. I clearly have a problem. What do you feel compelled to buy that just isn’t practical for your lifestyle? How do you resist these urges? Please share your perspective by leaving a comment. In the alternative, you can email me at terriretirement@gmail.com. Extra, extra… read all about it!!! My book, Changing My Mind: Reinventing Myself In Retirement is a suitable gift for all occasions. Besides being entertaining and informative, it is rectangular and easy to wrap! Perhaps you would like to visit https://secure.mybookorders.com/orderpage/2076 and order a copy or several. If you use the promo code terri , you will get a 15% discount. You can also order at amazon.com or barnesandnoble.com, but the promo code will not apply.